Bushmans Industrial is an Australian owned and operated business which manufactures a wide range of chemical, waste water and industrial tanks. These are distributed across Australia, along with a range of accessories and fittings for industrial applications. Bushmans Australia’s products include industrial, chemical and waste water storage, industrial water storage, agricultural fertiliser and rural water tanks. Bushmans products provide safe and reliable storage in mining and energy operations, chemical manufacturing and distribution, government facilities such as hospitals and education buildings and agricultural production. Bushmans has stood the test of time and is one of the most experienced manufacturers of large industrial tanks in Australia. 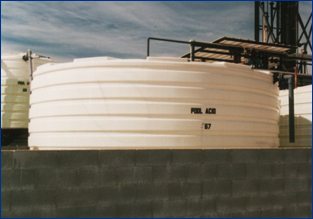 Custom manufactured tanks that are designed to suite a particular application or operation. Continuous design improvement by applying engineering expertise has resulted in stronger and tougher products. Production and freight scheduling systems, allows us to deliver when the customer needs the product. Bushmans local state-based sales centres permits the fast design and manufacturing of specialised industrial products as well as a greater understanding of local customer requirements. Bushmans products are quality tested and guaranteed. Bushmans has been designing and manufacturing industrial tanks since 1989 and with plants in Dalby – Queensland, Orange – New South Wales, Terang – Victoria and Adelaide – South Australia, we are able to service central and eastern Australia. When it comes to Industrial liquid storage, Bushmans delivers the goods in the toughest Australian conditions.